Adrienne: Hi, Peter. Or should I call you Monk? Which is it? Peter: It doesn’t matter. I’ll answer to either. Adrienne: Okay, Peter, when I interviewed Vic, he tried to take over, so I’m going to set some ground rules. I’m in charge, okay? No hijacking my interview. Peter: That’s fine. Unless you screw up. If you screw up, I’m hijacking. Adrienne: Because you’re my alpha-male on steroids? Izzy (heroine): His brother calls him the Emperor of Fix-it Land. Peter (huffing): I can’t stand that. I like to fix things, so what? Adrienne: Izzy, in A Just Deception he basically gets into everyone’s business. Do you like that about him? Izzy: I like that when he sees something wrong, he’ll do whatever necessary to make it right. Peter is the guy who stands up when everyone else sits down. He’s incredibly patient. When he loves you, he loves everything about you, including the ugly parts. In my experience, that’s not easy to find. Adrienne (laughing): I think she likes you. Izzy (snorting): That’s no joke. Peter: And she’s kind. She teases me about being the Emperor of Fix-it Land, but she’s no slouch in that department. She’ll take anyone or anything on. 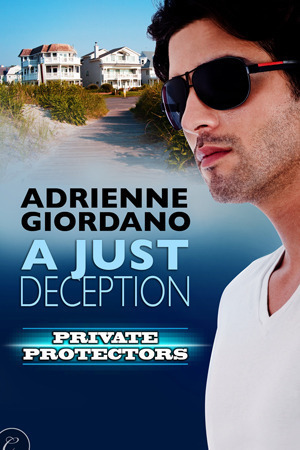 In A Just Deception, she’s asked to take on an assignment that could cause emotional carnage. She does it anyway and I admire that. Izzy (grinning): You’re too good to me, Peter. Peter: Just trying to stay out of trouble here. Plus, I’d like to get shagged in the near future. Very near. Adrienne: I love that word. Shagged. Peter: It’s aces. It gets the point across without offending anyone. Adrienne: Can we talk about the do-rag? Peter: What’s to talk about? Adrienne: You have the most amazing hair, but you cover it with do-rags. Izzy: It’s the curls. His hair has that little bit of curl that makes it unruly. I about died the first time I saw him hiding it with the do-rag. I thought he was crazy. Peter(laughing): The first time you saw me, I thought I was crazy. So did my boss. Izzy: He’s the sanest person I know. Aside from the do-rag. Although, I’ve adjusted and I don’t know that I’d like it if he didn’t wear it anymore. It’s him. Then again, put him in a French cuffed shirt and he’s devastating. Peter: I think I’m getting shagged in the very near future. Adrienne: Enough about the shagging. You still haven’t talked about the do-rag. Peter (shrugging): Ten years ago, I saw one with an American flag on it and bought it. I started wearing it, I liked it and now I wear one all the time. Izzy: His mother hates them. She calls them napkins. Peter: That’s true. Maybe I’m being a tad rebellious by wearing it around her. She says I dress like I got my clothes out of a dumpster. Adrienne: Okay, guys. Anything else you want to share with readers? Peter: Uh, we’re a little twisted? Izzy more than me. Adrienne: Oh, he did not just say that! Izzy (laughing): Actually, it’s true. Like I said before, I’m nuts. He knows I’m nuts and he likes me anyway. We can both be ourselves around each other and we don’t judge. It’s the raw us. There’s comfort in it. Peter: That’s a good way to put it. She challenges me on the things I don’t want to be challenged on. Adrienne: How do you feel about that? Peter: Mostly, I hate it. I get it though. Sometimes I need an attitude adjustment and she gives it to me. Izzy: Same here. We argue and then we’re done. Adrienne: Speaking of being done, thanks for hanging out with me guys. This was fun. Peter: Sure. I’ll tell Vic I did a better job than he did.